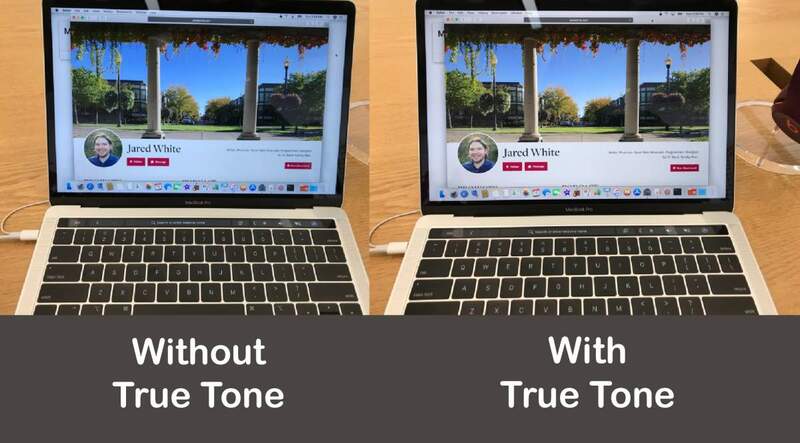 On my recent podcast episode, I talked about the importance of TrueTone on the new MacBook Pros from #Apple, but it’s hard to convey in words just what a difference this makes. It’s also hard to capture the subtlety of TrueTone with a camera because of the white balance auto-adjustment that occurs. But I managed to get a couple of shots that really show in a side-by-side camparison just how much of a big deal this is. With TrueTone, the computer display looks like it belongs in the environment around it, because the screen picks up the white balance of the ambient lighting in the room. Without TrueTone, it just looks like any old computer monitor (often with a blue-ish cast).